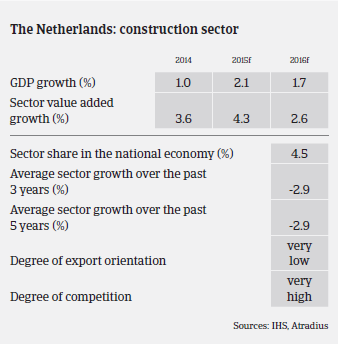 The recovery of the Dutch construction sector continued in 2015, but remains one-sided. Following two years of contraction, the Dutch construction sector finally rebounded in 2014, with turnover growing 1.5%. This recovery continued in 2015, in line with the pick-up of economic growth in the Netherlands (GDP up 2.1%). It is estimated that construction production volumes increased 3% in 2015, and further growth is expected in 2016. Home prices have recovered, and the sentiment of many construction companies has turned to be more positive, with businesses expecting revenue increases. That said, the recovery has started from a very low basis, as in 2014 construction volumes were still more than 20% lower than in 2008. The number of finished residential buildings decreased by about 60% between 2009 and 2014. At the same time, the recovery in the Dutch construction market remains one-sided, driven mainly by growth in the residential construction segment, while the non-residential subsector, especially the infrastructure and utility construction segments, still face modest demand. Residential construction output is expected to have grown 6% in 2015, and a growth rate of more than 3% is forecast in 2016. In the coming years the demand for newly built homes is expected to be structurally higher than during the crisis. The infrastructure segment has also partly benefited from improving market conditions, but strongly depends on the government as its main client and could be therefore negatively affected by any measures to trim the public budget. Competition between businesses in the infrastructure construction segment remains very fierce. At the same time, the utility construction sector still suffers from an imbalance between supply and demand. Many businesses active in this segment still show decreasing revenues with strong pressure on their margins. A positive exception is the increase in newly built logistics centres and an increase in the number of renovation and transformation projects. The Dutch construction sector is expected to show an average growth rate of about 2% in the coming years, given that economic growth remains robust. 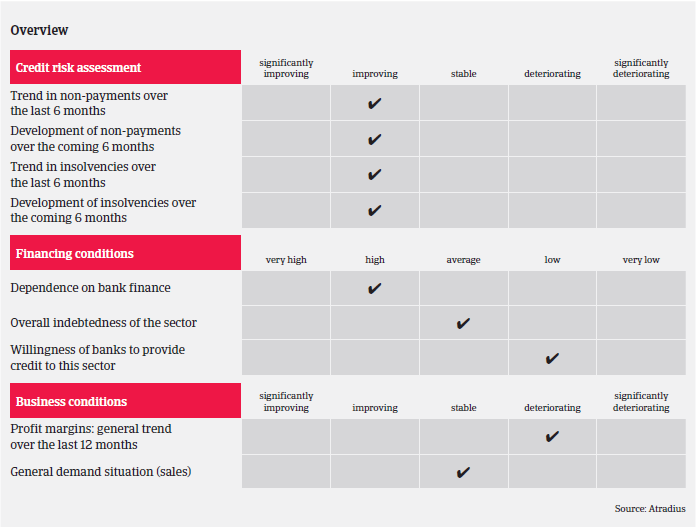 Due to the construction recovery, a decrease in non-payment notifications and credit insurance claims was recorded in 2015, and it is expected that non-payments and insolvencies will further decrease in H1 of 2016. However, the on-going strong competition in the market indicates that many Dutch construction businesses remain affected by price wars, leading to on-going pressure on margins. In the past years of downturn, the liquidity of many companies has weakened due to losses and impairments, straining both solvency and liquidity. At the same time, loan policies of banks towards construction companies continue to remain rather restrictive for the time being. As a result, businesses´ focus is still on cash flow and working capital - and on tighter credit management. Despite the fact that many Dutch construction businesses went bankrupt in the last couple of years, there is still overcapacity in the market, and a consolidation has yet to take place. While having slightly increased our risk appetite for Dutch construction businesses in 2015, we still maintain a cautious underwriting stance due to the still difficult market conditions. This approach is underlined by the fact that major insolvencies are still an issue despite the overall decreasing trend, such as the recent bankruptcy of the large technical service provider Royal Imtech N.V. When assessing a buyer’s creditworthiness, we require up-to-date financial information, and details of the 2015 order book and payment experience. Additionally, we seek details on a company’s financing (covenants/securities) and the maturity dates of bank loans. Our aim is still to maximise the insurance cover we can give our customers, and in this respect third party securities, if available, can help.